Education is a lifelong process. We have education classes for children, youth, and adults. Our membership class is especially useful for those who want to learn more about the Lutheran denomination. There is Sunday School for nursery age to adult 9:15 to 10:15 am each Sunday. 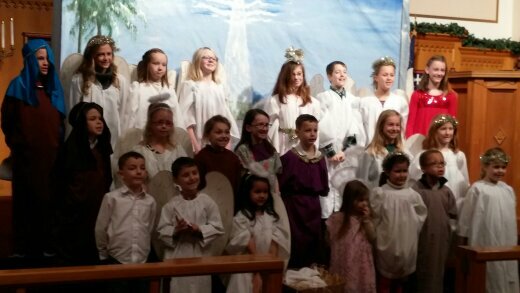 The Sunday School program at Trinity Lutheran Church provides a variety of activities each Sunday morning that keeps the child interested and engaged while learning important biblical lessons. Children's classes meet downstairs where children are joined by their teachers in various age group settings. Adult class is held in Weiblen Hall - adjacent to the narthex upstairs. Membership classes are offered twice a year (Spring and Fall) at Trinity Lutheran. The purpose of the course is to give instruction on becoming a member of the Lutheran Church by sharing the Lutheran doctrines and beliefs. We believe membership is first of all in the Church of Jesus Christ, secondly in a particular denomination, and thirdly in a specific congregation. This course is designed to be practical and make you feel more aware of what it means to live as a Lutheran. Respectful of time constraints, the class is generally offered on a Sunday afternoon, with lunch provided, meeting once for 3 hours. Additional conversation and reading is welcome as desired before choosing membership. The goal of this course is to give you a background of the Lutheran Church so you may decide if you wish to become a Lutheran. You are in no way obligated to become a member by your attendance in this course. It is our hope that if the Lutheran Church is not the church you choose to become a part of, that you will seek another denomination that meets your needs and beliefs. We want you to feel welcome at Trinity and use the services offered by the church and its pastors. If there are any questions you may have (or if you are interested in attending the next membership class) feel free to contact the pastor to discuss them. Catechism is a study of Lutheran doctrine for youth at Trinity. Upon completion, they become voting members of the church. Youth in grades 5 through 7 are invited to begin their 2 year journey of learning the faith - and are welcome to start that class when they and their parents think they are ready. Catechism classes meet on Wednesday evenings from 6:30-7:30 pm in the Lighthouse Room downstairs. The Catechism group attends a weekend retreat in November. 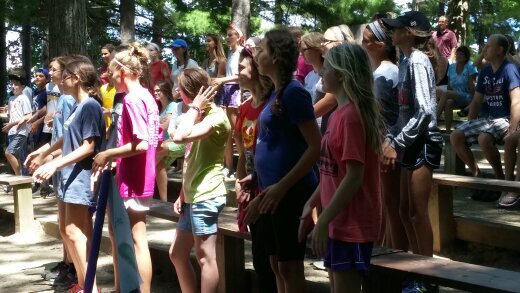 A summer Catechism camp usually takes place in July. Confirmation (Affirmation of Baptism) for catechism students is in late April or early May at the end of the student's 2nd year of classes. Catechism students will be assigned an adult mentor to assist in the nurturing of faith through regular guided conversations. Catechism students are required to attend worship and Sunday School regularly as well as complete service projects and worship notes. Catechism students are required to complete a Faith & Life project at the conclusion of each year of classes. This project reflects what they have learned and believe. An important part of our calling as a church is to educate people in the Christian faith. In our Lutheran tradition we do that with the goal of having people who were baptized affirm their baptism in the Rite of Confirmation. It is a special day for parents and sponsors who have fulfilled Baptism promises and for a congregation that has provided training. Vacation Bible School if a fun-filled week (usually in July) of games, songs, worship, and education. Watch for announcements at church or information in the monthly Trumpet newsletter. Volunteers are always needed to make this a week of enjoyment and instruction for our youth.